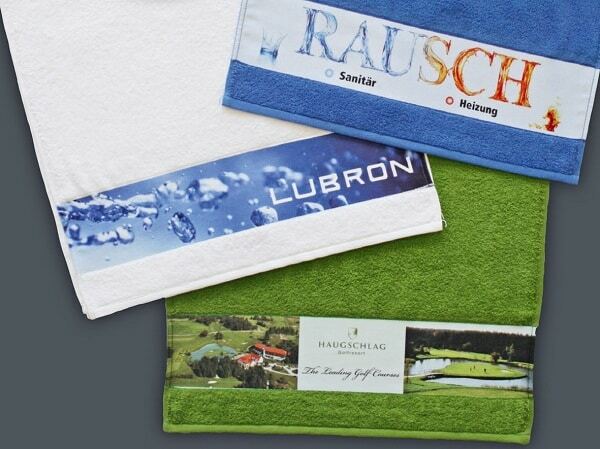 We turn your idea into a finished promotional product in a high premium quality.framsohn offers a variety of different finishing techniques to put your company logo in the spotlight! If you want to make your design or your logo particularly large, then the Jacquard Weaving is the right one for you! The positioning and the size of your design are independent of price. You can decide between the softer quality “single yarn terry” and the more robust quality “twisted yarn terry” from our Jacquard Weaving. Basically, your Jacquard Weaving request can be displayed in two colours. But we can also weave a third colour with a special weaving technique on some designs. Characteristic to the relief weaving is the illustration of your design as a relief, in doing so there are no loops at the draft of the towels’ front side which effects a plain surface at these „low“ points. In particular, relief weaving is often used whenever it comes to Uni-coloured towels. The design can also be extended by another colour by using a contrasting colour in the area of the “lower” points, where it then becomes visible. For best results we recommend our twisted yarn quality or a single yarn quality with a maximum weight of 450 g/m². Wenn Sie Ihr Logo bewusst dezenter präsentieren wollen, dann ist die Bordüreneinwebung genau das richtige für Sie, da man hierbei Grafiken auf kleiner Fläche sehr detailreich darstellen kann. Tücher mit Bordüreneinwebungen sind sowohl in Walk- als auch in Zwirnqualität umsetzbar. Basically, there are 2 types of woven border – the one-colour type with a shiny yarn and the multi-coloured type with up to 4 different shades. 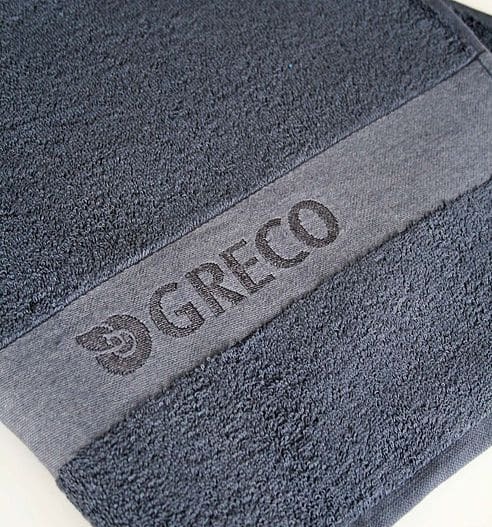 Using a unique-colour towel, your logo / design will look particularly elegant, as your logo is woven with a shiny yarn. 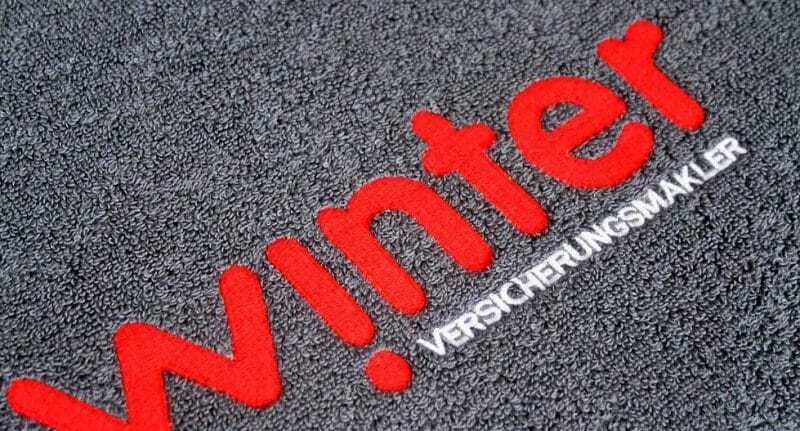 Due to the contrast of the matt ground yarn and the fancy shiny yarn, your company logo will really spark! But with up to four different colours, your logo can also be woven into the smooth border. 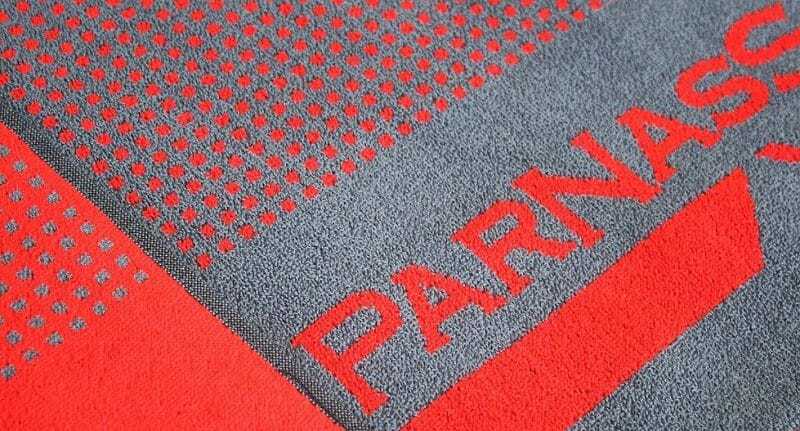 So we can also weave your colours, which identify your company with your customers in your towels. 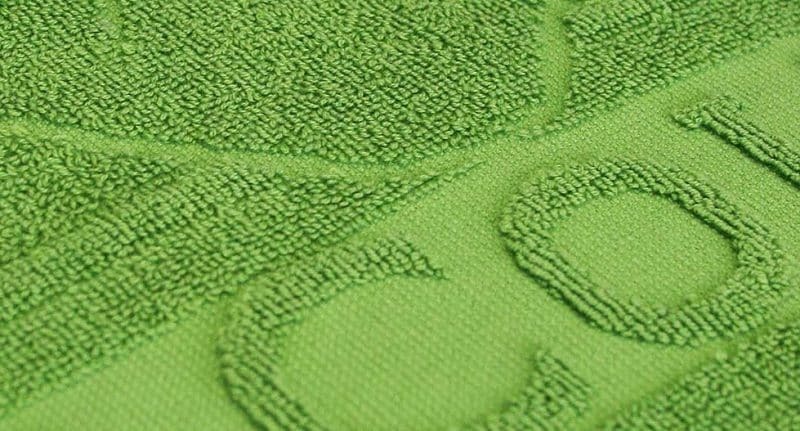 The basis for your embroidery is a towel of one of our Uniseries MaBelle, Premium or Quattro. Dimension, colours as well as minimum quantities are very flexible when choosing the embroidery alternative. The illustration of the logo details is achievable even on a small space. 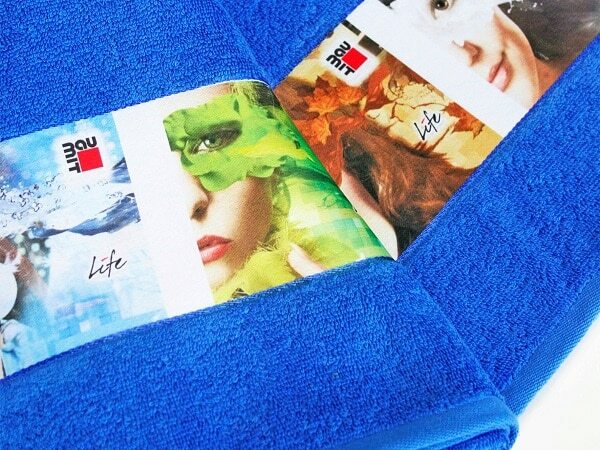 Our sublimation printing hand towels have been progressively developed by our textile experts at every step of the manufacturing process, providing an optimized printing surface that allows for much more detailed and brilliant prints than most other sublimation hand towels. So we can produce pin sharp prints in photo quality without limits in terms of colours and shapes at a fixed price including all set-up costs. 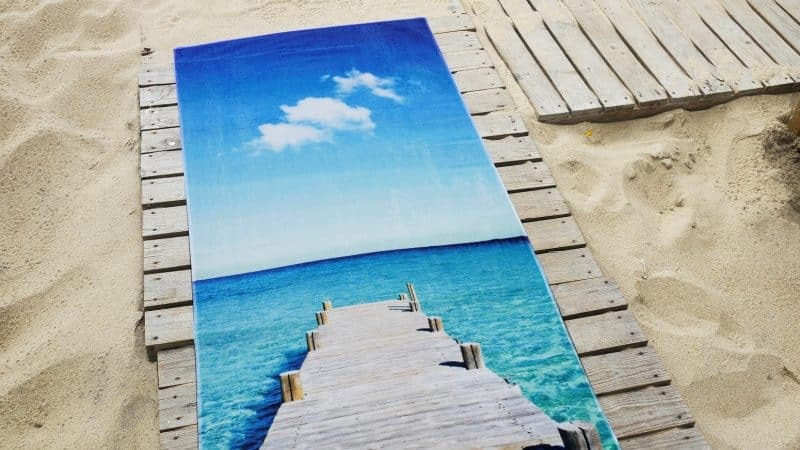 There are no limits to your creativity through the 14 basic colours of towels, bath towels, guest towels, golf towels and sauna kilt. We also have tea towels with printable border in the program, an ideal gift for your customers. You can order these articles at any time also unprinted with us and print them by yourself. This product is characterized by unlimited design possibilities – it is suitable for large-scale, colorful and above all eye-catching design ideas. Another advantage is the small minimum quantities, short delivery times and the unlimited colour and design possibilities. Our HD transfer printing has already received the Promotional Gift Award. The wide range of sustainably produced terry goods is produced totally by framsohn in Heidenreichstein. This creates added value and jobs in the region. The soft water from Heidenreichstein, which is used for dyeing and washing, enables a nature-preserving, production process. The purely mechanical water treatment does not contain any chemicals, which protects the fibers and keeps their natural softness. Due to our local advantages, such as the soft rock water of the region, the latest technologies, as well as creative and individual solutions, we implement your ideas flexibly and quickly. The preparation of culinary specialties and delicacies is becoming more and more an absolute lifestyle highlight. Organic and seasonal food, new technologies in the kitchen, trendy kitchen helpers and accessories, as well as a design kitchen make any hobby chef a star in the kitchen. 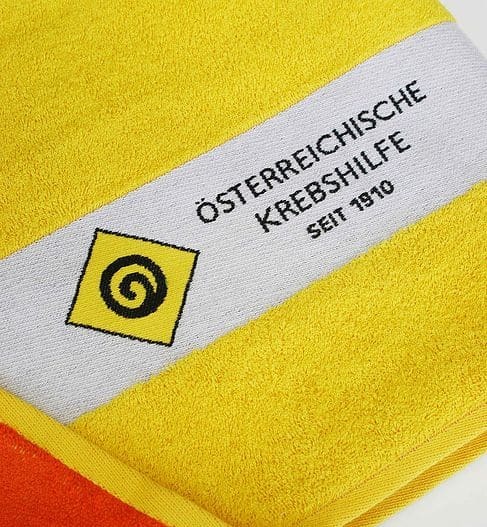 The variety of framsohn frottier´s articles, hand and tea towels are the perfect textile accessories for your kitchen. For a poppy seed producer, our design department developed a kitchen towel, which emphasizes the enjoyment of the natural poppy seed product. In the video you can see the individual design with which the company framsohn frottier won the Promotional Gift Award. A recipe for our region´s poppy noodles is shown via QR code. FREE of charge Info request!